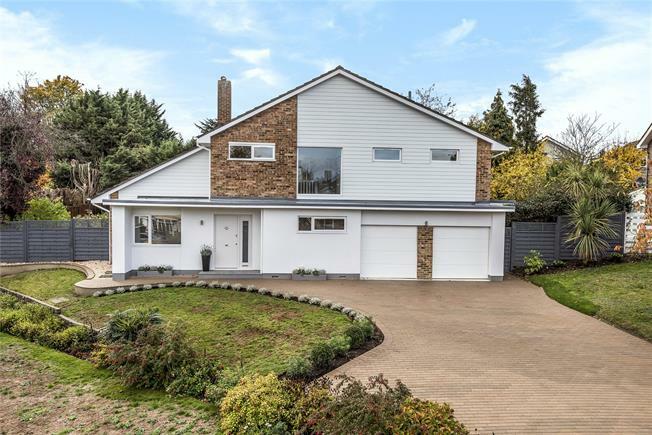 4 Bedroom Detached House For Sale in Bromley for Guide Price £1,185,000. This property's price has dropped from £1,250,000 to Guide Price £1,185,000. Standing on a large corner plot and located in a quiet cul-de-sac location within half a mile of both Bickley and Chislehurst mainline rail stations, is this fantastic four double bedroom family home. A full renovation programme has just been completed to a very high standard and boasts stylish and contemporary accommodation. The ground floor offers a large entrance hall, multi aspect living room with bi-fold doors, fantastic kitchen/breakfast room with a stunning 'Hutton' fitted kitchen with quartz work surfaces, Neff integrated appliances and a Bosch dishwasher. The kitchen also opens into a dining room with bi-fold doors, utility room and a WC. The first floor benefits from four double bedrooms with the master bedroom offering a feature Juliet balcony, fitted wardrobes and a luxury en suite with walk-in shower. There is also a family bathroom with separate shower enclosure. Outside enjoys a secluded south west facing rear garden that is mainly laid to lawn with feature decked area. The front of the property offers a large driveway which leads to a double garage with two electric up and over doors. Other important features to note are; 'Worcester Bosch' boiler with mega flow system, Amtico flooring, solid wood internal doors & 'CP Hart' sanitary ware in all bathrooms and the WC. Properties of this size and calibre are rarely available.